karum kadalE – Oh, black coloured ocean! mAlum – this word means stupefied or overwhelmed or bewildered. Just as people who get intoxicated after consuming certain types of drinks, the ocean is also feeling intoxicated due to the touch of emperumAn constantly. 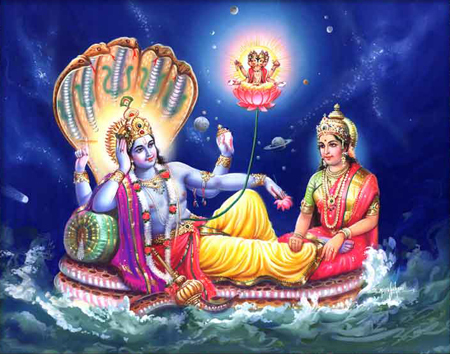 The ocean has the same happiness that mukthars (those who are liberated from samsAram (materialistic realm) and have reached SrIvaikuNtam) have on enjoying emperumAn. karum kadalE – wouldn’t the ocean have become pale otherwise? But, emperumAn is lying on milky ocean, which is white in colour. How is AzhwAr then referring to it as the dark coloured ocean? It is said that emperumAn lies in all oceans and hence it is called as dark coloured ocean. Alternatively, the qualities of an ocean are referred to, in all places. Hence it is called as dark coloured ocean. Another explanation is that since dark coloured emperumAn is lying on it, the ocean too has become dark and hence AzhwAr is referring to it as dark coloured ocean. Ocean and emperumAn are having the complexion of bharatha (white) and rAma (dark) respectively. en nORRAy – what penance did you carry out to be inseparable from emperumAn? AzhwAr wants to rid his attachment toward emperumAn and carry out the same penance for a similar result. vaiyagam uNdu Alin ilaith thuyinRa – keeping all the worlds within his divine stomach and lying on a banyan leaf which appeared at the same time. AzhiyAn – lying atop the banyan tree with all the weapons required for protecting. Holding the sudharSana (disc) weapon on his hand, emperumAn says that he will release the disc and tear apart the deluge if it comes to swallow the earth. Alternatively, Azhi could be construed as referring to ocean and in this case it would refer to his reclining on oceans. kOlak karumEni sem kaN mAl – eyes which are beautiful, remove the tedium of beholders and shower affection on them. His divine eyes are like those referred to in chAndhOgya upanishath 1-6-7 “yathA kapyAsam puNdarIkamEva akshiNI” (eyes like lotus flower just blossomed by sun). mAl – if the meaning is considered as pride, this word will refer to Isvaran (one who controls). If the meaning is considered as infatuation, it will refer to one who has lot of love. enRum – at all times. Even if pirAtti (mahAlakshmi) out of a rare discord with emperumAn were to leave him, the ocean has no separation from emperumAn. AzhwAr is praising the good fortune of ocean which, unlike him, has no separation from emperumAn. For upAsakas (those who attain emperumAn through upAsana or bhakthi (devotion)), attaining emperumAn is the end result; kainkaryam is like a by-product. In the same way, for the ocean, feeling emperumAn is the end-result. Just as sweat comes out when one is pounding paddy, kainkaryam, like sweat, comes automatically when emperumAn is attained [through devotion]. If the underlying knowledge about emperumAn, who is the means for attaining him, is obtained, strong belief in him comes on its own. thirumEni nI thINdap peRRu mAlum karum kadalE – Oh ocean! You are in a stage of stupor after attaining him. I am bewildered because I have not. karum kadalE – He showers qualities which he himself has, on those who he wants to grace. That is why you are also dark, like him. It appears that you have carried out some penance to get this. At the same time, it appears that this has come about because he has graced you especially. Let us go on to the 20th pAsuram next. This entry was posted in iraNdAm Ayiram, periya thirumozhi, thirunedunthANdakam on June 28, 2017 by T N Krishnan.